Join the discussion on our forums! Come discuss Venomancer over in our dedicated Venomancer discussion topic. expensive poison cards are generally very weak, but it's still interesting enough of a tag that i wouldn't call this pack filler. Decent arena pick. This card is going to attract hard removal. Love it! You know where dota came from, right? I do not, for the life of me, understand why they value this Tag so high. 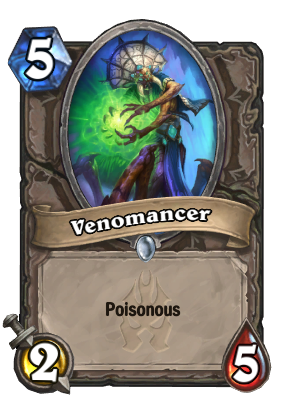 Poisonous isn't that great when you remember rule 1 of Hearthstone- NOTHING survives more than 1 turn. With 5 HP it's pretty resilient, but so was Maexxna at 8 and yet nobody played her, ever. To be fair, nothing survives more than one turn, often, because it gets traded into. This is brilliant for trading. Still, Maexxna didn't see play so this won't either. Plain and simple. Oh yeah, and if nothing survived more than one turn, Vicious Fledgling would be weaker than Razorfen Hunter. So I think your rule needs a little work. friendly reminder that Maexxna barely ever saw play, and this looks even worse than her. Pit Snake is a class card and is supposed to be superior on Emperor Cobra with -2 cost and -2 health. This one has +2 Health and +2 Cost over the Emperor Cobra, making it weaker than Emperor Cobra. I would play Pit Fighter over this almost anytime. Pretty cool card, as it has a lot of health alongside the effect. Except it doesn't. 5 health is below average for a five drop. Just compare it to Maexxna - 3 more health for 1 mana and still never saw any play.